Whenever I get the chance to travel to Northern California, there is always great wine. But San Francisco and the nearby wine country, of course, also serve up some of America's best dining - typically the kind setting trends that Philadelphians might see in a year (or two). That gap may be closing, though, based on some of the highlights from my brief eating stops in San Francisco on the way to Sonoma. The fermentation craze (kimchi-pickled everything), local ingredients, craft cocktails, artisanal coffee, and small plates we have. But as always, the best flavors from my trip show San Franciscans do it with their own style. Here's a roundup of my most memorable bites. Very few restaurants merit a 45-minute wait in the hope of landing a walk-in table. But State Bird Provisions (1529 Filbert St.; statebirdsf.com), last year named the best new restaurant in the country by the James Beard Foundation, belongs on that list. The setting is casual, with pegboard walls, a lively open kitchen, and bare polka-dot tables. But State Bird has mastered the art of seasonal small plates delivered with a clever, unique twist: dim-sum carts that roll with a dozen of the daily in-the-moment offerings. There's a notable set menu of favorites, too, including an awesomely moist fried quail (California's state bird) with lemony onions and a bagel-inspired "everything" pancake topped with smoked sturgeon and a dollop of horseradish cream. But every time that cart rolled around, we basically said "yes!" Good move. I adored the briny-sour-spice of the raw oyster topped with kohlrabi kraut, sesame seeds, and chile oil. But we also scooped up creamy Dungeness crab-belly dip with house-fried chips, as well as King salmon tartare with fermented turnips. The guinea hen dumplings splashed in lemongrass broth disappeared in a gulp. My first fresh herring, simply grilled alongside caviar aioli, was memorably dusky. The finishing touch was a warm shot of peanut "milk" poured into a glass of muscovado syrup. State Bird reserves a good chunk of its dining room each night for walk-ins, and it's an appealing first-meal target for East Coasters fresh off the plane. By the time we sat down to dive in, 5:30 p.m. West Coast time, it was still prime dinner time in Philly. Great bread and coffee are two San Francisco hightlights. At the Mill, a yearling at 736 Divisadero St. (themillsf.com), two outstanding artisans in their field - Josey Baker Bread and Four Barrel Coffee - combined forces for an airy storefront space with an open bakery atelier in back, ringed by a hangout cafe. I adored the rustic-crumbed sourdough loaf of the "Workingman's Bread," made with fresh-milled rye, wheat, and sprouted rye berries - it anchored my carry-on luggage. A precious bag of Andino Especial from Colombia was pricey, but also a syrupy elixir in my cup that was one of the best coffees I've drunk of late. If you have a moment to stay, though, the Mill's menu of composed "toasts" is also a treat: The contrast of sweet pumpkin butter smeared over thick whole wheat toast scattered with sea salt was irresistible. Talk about irresistible. Few of the upscale delights in the Bay area have quite the hold on me that In-N-Out burger does. 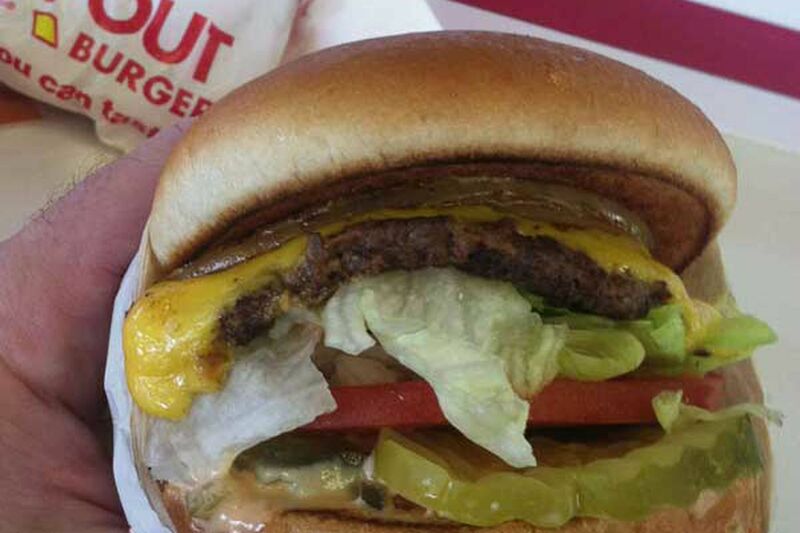 There is some national debate over which is the better burger chain, In-N-Out or Shake Shack. Some of my Western colleagues have even chimed in that they felt In-N-Out is overrated. I say the grass is always greener, considering my love-hate frustration at the Shake Shack's inconsistencies in Center City. All I know is that after a week of wine-sipping in Sonoma, I could not get to the golden arrow of In-N-Out's Santa Rosa location fast enough. One "Animal-style" burger later (that's secret menu-speak for a patty griddled with mustard and served with grilled onions), I knew my answer. All I had left were empty In-N-Out wrappers and the hope that it wouldn't be too long until I made my way west again.